The hydrogen economy had been written off as a failure by most industry watchers, writes independent energy expert and former software engineer Roger Arnold. Lately, however, hydrogen seems to be making a comeback. Not because of any special technology breakthroughs but because persistence and general advances have begun to pay off. After more than two decades of hype about the imminent arrival of a transformative “hydrogen economy”, many veteran technology watchers — myself included — had concluded that hype was pretty much all it was. Hydrogen fuel cell vehicles in particular looked like a failed dream. Bright innovators like Canada’s Geoff Ballard had attacked the problem and burned through serious investment money trying to develop a product that could stand up to the rigors of the automotive market. All with little success. And beyond the cost and durability issues of fuel cells themselves, the hydrogen storage issue stubbornly resisted commercially practical solutions. In recent years, hybrids and battery electric vehicles have appeared to hold the inside track for low carbon and zero carbon transportation. Tesla has reshaped perceptions of what is possible for battery electric vehicles. The cost of lithium-ion battery packs has been driven down, while capacity, performance, and reliability have increased dramatically. To be sure, government programs have continued to fund fuel cell R&D. If nothing else, fuel cells still hold broad appeal for military programs. But to those of us who felt we understood the issues, the barriers to broad use of hydrogen as an energy carrier looked pretty fundamental. We — or at least I — didn’t really expect to see them fall anytime soon. In the face of that expectation, a spate of announcements and news articles over the past year relating to hydrogen have come as a shock. Most prominent have been recent announcements by Toyota, Honda, and Hyundai of new FC vehicles for production release in markets where hydrogen refueling stations are available. Toyota announced the Mirai, Honda announced the Clarity Fuel Cell, and Hyundai announced the Tucson Fuel Cell SUV. But those were just the commercial announcements backed by ad campaigns. When one starts digging, scores of significant news stories and announcements from around the world turn up. 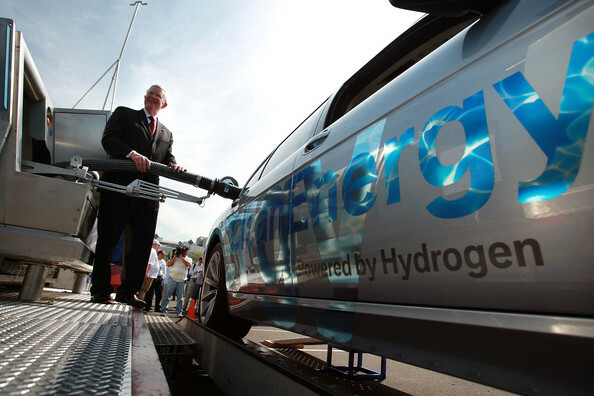 The whole idea of the hydrogen economy — which never quite went away — seems to be resurgent. So what is it that happened while I wasn’t paying attention? A thorough review seems in order. Since battery vs. fuel cell EVs are at the eye of the storm, I’ll start there. Then I’ll go on to look at some of the broader issues of energy storage and hydrogen production. Despite disappointing progress in the early years of the Bush “Freedom Car” initiative, fuel cell R&D never dried up. It has been ongoing, and not all of it has been politically driven. There has always been genuine promise in FC technology. The problems have been cost and durability. As far as I can tell, there have been no singular technology breakthroughs behind the resurgence of interest in hydrogen. But persistence and general advances in materials and manufacturing have begun to pay off. A small example: automated machinery able to make reliable gas-tight welds between thin sheets of metal. That turns out to be crucial for fabrication of efficient bipolar plates in PEM (polymer electrolyte membrane) fuel cells. Analysis by the Department of Energy’s (DoE) Fuel Cell Technologies Office puts present cost of automotive FC stacks at $53 per kW for manufacturing volumes of half a million units annually. That’s half of what was projected for the state of the art in 2006. Ironically, one thing widely seen as needing to change before FCEVs (fuel cell electric vehicles) could become practical has stubbornly not changed: technology for carrying hydrogen on-board the vehicle. Despite a plethora of promising lab developments, there seems to have been no practical breakthrough in hydrogen storage. The new FC vehicles all use high pressure gaseous hydrogen stored in polymer-lined, fiber-wound pressure tanks. Similar tanks were made by Quantum in the 1980s. The tanks remain heavy, bulky, and costly. However, with better manufacturing methods and stronger, cheaper carbon fibers, their cost now measures in the low thousands of dollars rather than the high tens of thousands. From Toyota’s product sheet for the Mirai, the fuel cell system delivers 2.0 kW/kg with a power output of 114 kW max. That implies a FC system weight of 57 kg. The hydrogen tanks hold 5 kg H₂ at a weight percentage of 5.7%. That implies a tank weight of 83 kg. So, 145 kg total for tanks + FC system + 5 kg hydrogen, delivering an EPA estimated range of 312 miles. That compares to 540 kg for the battery pack in a Tesla Model S with a rated range of 265 miles. It appears that despite the heavy and bulky pressure tanks, the Mirai delivers a greater driving range than the Model S, with roughly a 4:1 weight advantage for the energy delivery system. More important for most buyers, however, will be the system cost per kWh to the drive motors. That’s harder to nail down, because manufacturers don’t normally release cost data publically. There’s a small cottage industry devoted to guessing and predicting the cost of Tesla’s battery packs. GTM Research projects that by 2020, Tesla’s average cost for packs will be $217/kWh. Using that figure, the 85 kWh Model S battery pack would come to $18,500. That’s less than some estimates, but more than the $12,000 that Tesla itself is willing to guarantee to Model S owners as the replacement cost after 8 years. Everyone agrees that costs are on the way down as production from new battery “gigafactories” kicks in, so $18,500 is probably a reasonable figure to use for near term comparisons between battery and fuel cell vehicles. On that basis, fuel cells appear to come out ahead of batteries on cost as well as weight. At $53 per kW, the Mirai’s 114 kW fuel cell system would cost just over $6000. The high pressure storage for 5 kg H₂ is probably around $3000. So the capital cost of the Mirai’s energy delivery system with longer range looks to be roughly half that of the battery pack for the Model S.
Of course, FC vehicles are also much faster to refuel. That’s widely considered their strongest market advantage. But it presumes a network of public hydrogen refueling stations that for the most part does not yet exist. Normally a “chicken and egg” problem like that would be lethal for a new product introduction. It may prove to be so in this case as well. However, there are some special factors for hydrogen that could potentially enable it to break through. We’ll get to those. First, though, we should look at other issues on the flip side of fuel cells relative to batteries. There are many ways to produce hydrogen. For electrification of transport, the green vision is that it would be by electrolysis of water. That vision is promoted for hydrogen fueling stations. The H₂ to be dispensed each day would be produced on-site the same day or the day before by electrolysis. That reduces on-site H₂ inventory, enhancing safety, and minimizes the capital cost of the station. It also avoids the need for new and costly infrastructure to distribute hydrogen. No need to either dig up the streets to lay hydrogen pipelines, or have liquid hydrogen tanker trucks mixing with city traffic. In that scenario, the relatively low efficiencies of PEM fuel cells and electrolyzers put fuel cells at a distinct disadvantage relative to batteries. For each kilowatt-hour delivered to the drive motors of the vehicle, the electrolyzer/fuel cell system requires roughly twice the kilowatt-hours of energy input as the battery system. The rough 2:1 difference in electrical load that FCEVs impose is bad enough, but it also carries over to the indirect carbon emissions of the two classes of vehicles. In terms of what they emit on the road, both BEVs (battery electric vehicles) and FCEVs are zero emission vehicles. Both, however, inherit indirect emissions via the power grid. If the grid were supplied entirely from carbon-free power sources, then both BEVs and FCEVs would be carbon-free as well. But that’s far from the case today. A 2:1 difference between FCEVs and BEVs electrical load means that an FCEV will have double the indirect carbon emissions per mile of a BEV. The actual difference in fuel cost per mile will be quite a bit greater than the 2:1 difference in electrical load suggests. For BEVs, the fuel cost is just the cost of the electricity consumed in charging. There is no capital equipment of any significance between the vehicle and the power grid. For FCEVs, however, there’s the electrolyzer, hydrogen storage, dispensing system, and the commercial property hosting the station. There is also the daily operational overhead of running the station. Those elements raise the retail cost of hydrogen dispensed well beyond the cost of electricity to the electrolyzer. Solid estimates of what can be expected in the near future are hard to come by. A jumble of subsidies confuse the picture, and estimates for future costs are sensitive to assumptions about rates of adoption, size of refueling stations, and the technology used for supplying H₂. DOE’s aspirational goals for 2020 are a wholesale production cost of $2.00 or less / gge (gallon of gas equivalent; ~1 kg of H₂). The goal for price at the pump, exclusive of taxes, is $4.00 or less (ref. here). The bottom line is that fuel costs for an FCEV will be at least 5 to 10 times more than for a BEV for some years to come. I doubt that zero-carbon electrolytic hydrogen will ever be less than 4x as expensive. However for context, the fuel costs for a BEV are a fraction of those for a gasoline vehicle and are usually considered negligible. If the cost of hydrogen in an FCEV were 4 times higher than the per mile cost of electricity in a BEV, most drivers would find it acceptable. Fuel would still be a small part of the overall cost of owning and driving a vehicle. Witness to that is the fact that manufacturers of FC vehicles can afford to bundle free hydrogen into the purchase price or lease terms for the vehicles in their California test markets. Perhaps most significantly, the arrival and spread of autonomous vehicle capabilities will transform the automotive market in ways that significantly affect the tradeoffs between hydrogen and batteries. I’ll talk about that later. Controversy over batteries vs. fuel cell aside, there’s consensus on one aspect of future vehicle technology. Electrical motor-generators and solid state power controllers will increasingly be at the heart of drive systems. They make for cheaper, more reliable, and higher performance than mechanical transmissions and engine-coupled drive shafts. Ultimately, all future vehicles will be either pure BEVs or hybrids. It’s not touted, but the new FC vehicles are, in fact, already hybrids. Toyota’s Mirai is built atop the Prius’ drive system. The two share many components, including traction battery and power controller. That enables regenerative braking and instant throttle response. It also buffers the FC system and reduces its cost. Commonality of components with Prius and a more benign FC environment are key parts of how Toyota limited its costs in fielding a new FC vehicle class. All it would take to produce a plug-in hybrid version of the Mirai would be addition of a plug-in charging port. The same is likely true of Honda and Hyundai FC offerings as well. But batteries and fuel cells are competing for mindshare in the EV marketplace; it’s understandable that companies backing an FC play don’t want to expose the HEV (hybrid electric vehicle) roots of their flagship FC vehicles. It wouldn’t make marketing sense. A charging port does make technical sense, however. Local miles could be driven mostly in battery electric mode. The cost per mile would be low. Hydrogen consumption for a typical driving profile could be cut by half or more. In Europe, Symbio FCell has in fact taken that approach for a range-extended Nissan e-NV200 van for the taxi market. A plug-in hybrid capability mitigates the hydrogen infrastructure issue for FC vehicles. They remain drivable even in areas without hydrogen refueling stations. The limited plug-in battery range might be a pain, and drivers would still want to have hydrogen refueling available near their home base. But they wouldn’t be tightly tethered to that base. The plug-in capability would provide flexibility, drawing from on-board hydrogen to extend range between plug-in chargings, or drawing on plug-in charging to extend range between hydrogen fill-ups. The switch to electric drive changes the tradeoffs between batteries and fuel cells. It’s no longer a stark either-or choice. If electric drive and at least a modicum of battery capacity are givens, then the issues become how much battery capacity to have and what technology to employ for delivering extended range beyond what the hybrid drive battery supports. If the latter is enough to let local miles be driven mostly in battery electric mode, then the optimal solution for extended range is one that minimizes added vehicle cost. That holds even at the expense of higher fuel costs for times when the extended range capability is tapped. It’s possible that neither large batteries nor hydrogen fuel cells are optimum choices for range. With large batteries, capacity above and beyond the needs of local driving may be a costly way to achieve an infrequently tapped range capability. And while future batteries will be lighter and cheaper, that also makes it attractive to offer more capacity for local driving. Increased capacity in the basic battery pack reduces the frequency of resort to the extended range capacity. The conceptual simplicity of having a single large battery may not be worth the cost. Separate subsystems could deliver greater range at lower vehicle cost, while enabling fast fueling as a bonus. The separate subsystem for extended range might or might not be hydrogen. The added vehicle cost of the hydrogen approach looks like it would be about $9,000; that’s not small, but it’s not all that far above the cost of an IC engine and the various subsystems around it. The question is, what would it be buying? With a fully decarbonized electricity grid and electrolytic hydrogen, the HFC approach would be buying carbon-free transportation. Yet if addition of easy and ubiquitous plug-in capability with larger hybrid drive batteries has already enabled most local miles to be driven in battery electric mode, then carbon emissions have already been slashed. If average fuel consumption for new plug-in vehicles is already 150 mpg or better, then the incentive to use hydrogen will be weak. 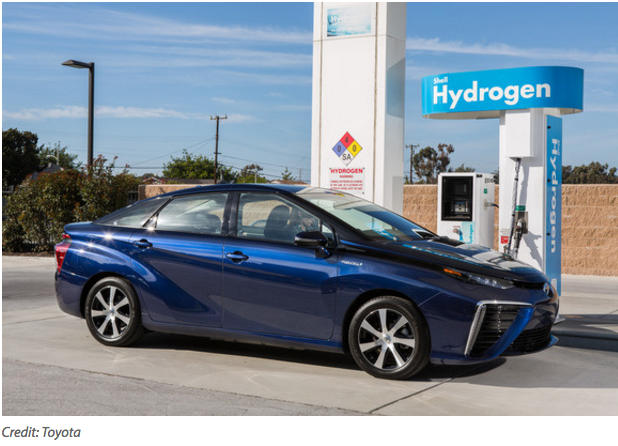 Barring a major breakthrough in hydrogen storage technology and further reductions in fuel cell cost, the default competitor to both batteries and fuel cells for extended range driving will likely be gasoline or compressed natural gas. Perhaps, if the price of fossil carbon emissions gets high enough, a carbon-neutral synthetic fuel might prove cheaper and more competitive. The energy cost of producing synthetic fuels from CO₂ and H₂ isn’t much greater than that of H₂. The discussion so far has been about passenger cars. For a broader view of the hydrogen economy, we need to consider heavy transport as well: trucks, buses, trains, ships, and airplanes. Not to mention farm and heavy construction machinery. For the sake of brevity, I won’t cover any of the latter here. But trucks and buses play big roles and warrant comment. For trucks and buses, the factors favoring hybrid electric drive systems are at least as strong as they are for passenger vehicles. The ability to deliver smoothly controlled torque for acceleration and uphill driving across the full speed range, with attendant capacity for regenerative braking, are attractive. Electric drive can deliver performance and safety advantages, along with fuel economy, clean air, and quiet operation. Low production volume for the heavy duty batteries, power control units, and motor-generators have hampered widespread adoption so far, but things are changing. For energy supply to the electric drive system, there are different tradeoffs and different options that may be favored, depending on the application sector. All-battery approaches are attractive for metropolitan buses and utility trucks. Metro buses spend hours parked each day, either in their barns at low service times or at route ends while drivers change or take rest breaks before starting their next scheduled runs. It should be relatively easy to provide fast recharging at those points. The on-board batteries should never have to deliver more than about 25 miles in regular service. For long-haul trucking and inter-city buses, all-battery approaches are currently impractical — and likely to remain so. Hydrogen has potential opportunities there. The recent unveiling of the prototype for the Nikola One electric semi (pictured below) has, in fact, caused quite a stir. The truck is a hydrogen FC model, and its specs are quite impressive. 1000 horsepower (twice that of a diesel semi), 2000 ft. lbs torque, range of 1,200 miles, … If Nikola Motors can deliver on its promises, it will have a winner. Production deliveries aren’t scheduled to start until 2020, but truckers have already been plunking down $1500 deposits for reservations. The high cost of electrolytic hydrogen will still make the per-mile fuel cost for a Nikola One relatively high — assuming that Nikola Motors is even able to deliver on ambitious plans to build solar farms for supplying its trucks with zero-carbon hydrogen fuel. The financial case for the vehicles would probably be stronger if they ran on compressed natural gas rather than H₂. They would still be hybrids — the Nikola One is planned to carry a 315 kWh battery that will give it the power to maintain 65 mph up a 6% highway grade and soak up the energy of descent from a mountain pass without touching the brakes — but it would lose its cachet as a hydrogen fuel cell vehicle. It could retain some of that cachet if the Nicola One used high temperature solid oxide fuel cells (SOFCs) that run directly on methane. That’s an approach recently demo’d by an alliance between Ascend Energy and Atrex Energy. High temperature SOFCs are at least as efficient as PEMFCs, and if their high temperature waste heat is used to power a Brayton cycle turbine, they are a lot more efficient. The combination would certainly make for a low-carbon vehicle. To be zero-carbon, however, the methane burned would need to be from a carbon-neutral source. I haven’t yet covered the likely impact from autonomous vehicle developments, nor have I talked about different technologies for hydrogen production, or the use of hydrogen for energy storage and backing of intermittent renewables. Those are important topics, but I’ll leave discussion of them for part 2, next week. Roger Arnold, systems architect at Silverthorn Engineering, is a former software engineer. He studied physics, math, and chemistry at Michigan State University’s Honors College , where he graduated in 1967. A US Army veteran (courtesy of the Viet Nam era draft), he later did graduate work in computer architectures and operating systems at the University of Colorado. Over the years, he has worked variously for IBM, Boeing Aerospace, AT&T, and about a dozen smaller companies and startups. Since retiring from professional life as a processor architect, he has refocused on clean energy technologies, energy efficiency, and space systems. His favorite activities are currently technical writing and mentoring early stage startups. This article was first published on Energy Post’s sister publication The Energy Collective and is republished here with permission from the author. Take natural gas and combine it with steam (water) in the right kind of chemical reactor and you get CO2 and Hydrogen. Of course, at current prices the fossil fuel majors would LOVE another market for natural gas. Fine, you can use electrolyzers. Except anyone who has actually worked with them knows that the real efficiency is never as good as claimed. The electrodes passivate and you get less and less Hydrogen and more and more waste heat. If the point here is to turn natural gas into a transportation fuel then … just compress and burn the natural gas! That would avoid all the wasted investment. But don’t delude yourself into thinking that this is in any way, shape, or form a “green” technology. If it’s just SMR, then you’re right, it’s not green, and you’d arguably be better burning the methane as CNG fuel. But I was writing about SMR with CCS. The hydrogen from that process is every bit as “green” as hydrogen from electrolysis — and a good deal greener if the electricity for electrolysis came from the grid — but three times cheaper. Yes, you’d be giving the fossil fuel majors a new market for natural gas — at the expense of the market for whatever the gasoline or diesel that the clean hydrogen replaces. Sounds like a good deal to me. Our goal should not be to punish the fossil fuel majors in any way we can for being evil people. It should be to secure their cooperation in steering the world away from the disastrous path it’s now on. There is of course additional research underway to eliminate the steam reforming process and use less energy. Its the long term possibilities not the very near term use that you need to be looking at for H2. The list above are just a real quick look for research into low energy, lower cost catalysts for H2. Ten years from now – we could potentially see the $ equivalent for H2 to be blow the DOE’s target of $4/gal… if a break through were to happen it could drop down close to parity with BEV quickly. Think long term 7-15 years in the future. Thanks for posting those links. They’re interesting, but as you note, they’re about research into lower cost catalysts for electrolysis of water. They don’t appear to address the basic problem that limits the energy efficiency of electrolysis and hydrogen fuel cells. That’s the overpotential barrier for the oxygen evolution reaction. Unless / until that problem is solved, batteries will retain a strong energy efficiency advantage over electrolytic hydrogen and fuel cells. I agree that ten years fro now we could potentially see the price for electrolytic H2 below $4.00/gge — at least in low latitude desert regions where solar capacity factors make solar electricity cheap. Note, however, that the US price of H2 produced from natural gas is *currently* only about $1.00 / gge. Hydrogen from natural gas is not renewable, and it’s only zero-carbon if the co-produced carbon stream is sequestered in some manner. However it can provide a quickly scalable source of hydrogen for distributed CHP. That’s the ideal way to back up variable renewables, and getting the infrastructure deployed quickly would be a huge win for the environment. I write about some of the issues around hydrogen production in part 2 of this article, posted elsewhere on this site. Let’s look at how we get hydrogen from water. A mole of water is 18g, so for every 18g you need 235.5 kJ of energy. 1 litre of water is roughly 1000g, so 1000/18 x 235.5 kJ = 13.1 MJ of energy. So 13.1 MJ to convert 1 litre of water into hydrogen and oxygen. For reference, that’s slightly less than the average British person consumes in a day. The reaction produces 1 mole of H2, which weighs 2g. So again, you need 235.5 kJ to produce 2 grams of hydrogen. To produce 1 kg of hydrogen you need 1000/2 x 235.5 kJ = 117.75 MJ. 5 kg of hydrogen at 700 bar is roughly 80 litres. 5 kg of hydrogen at air pressure is 56,000 litres (that’s not a typo). To compress 56,000 litres of gas to 80 litres takes 37 MJ. To fill up the Mirai’s 5 kg tank, that’d be 588.75 MJ. Now, you don’t need to understand all those numbers. What you need to understand is that the universe in which we live demands that we use energy to get hydrogen out of water and to compress that hydrogen so is can be stored in vehicle tanks. You need to understand that those are energy requirements and it is extremely unlikely that we’ll find our way around the laws of physics. Look at the graph below. (Can’t show graphs on this site.) Electrolysis and compression eats up 36% of the input energy. Add in transportation to the filling station and half of the energy is gone. That’s a lot of renewable electricity that could be driving EVs down the road. In discussing the viability of hydrogen electrolysis, it may be worth pointing to some of the gaps that exist within the electricity generation and supply system at present. Battery storage has a fixed capacity and this makes interseasonal or longer duration storage impossible as larger RE quotients are produced. That we do not have large-scale electrolysis yet means that cavern storage or adequate plastic (polyethelene) gas pipeline networks are not going to be utilised. Thus the issue of storage is not as insurmountable as may be initially perceived. Realistically, storing energy remains the primary hurdle over which an increasing RE quotient stumbles. As curtailment rates hit 25% in many countries, we are left with ever-increasing quantities of zero or negatively priced electricity. This electricity then becomes an ideal candidate for conversion to gas. Add to this the staggering price drop of electrolysers – ITM have just announced that they have met the European 2020 target of €1 million / MW, and expect electrolysers to halve in price by the mid-2020s to €500K / MW, and we have very low cost (or negative) energy combined with low capital expenditure – and (as this point receives little attention) – the competetive nature of hydrogen pipeline infrastructure, against electricity which comes with an 8% loss. Conventional electricity infrastructure is expensive and will most likely require additional investment as policy increases electrification, putting further strain on aging infrastructure. Overhead cables are expensive and intrusive – more so than windfarms – whereas plastic pipes are cheap and can be buried. Given that hydrogen has uses within the fertilizer, plastics, chemical, energy storage & grid balancing, transport fuel as well as conversion to methane and other synthetic fuels, I believe it may be about time we gave this much maligned energy medium the credibility it deserves. Just another couple of points here: Europe and the UK used ‘town gas’ containing 50% hydrogen up to the 60s and managed to switch over to methane within a few years – the reverse should be possible. Hydrogen is already approaching the DOE target of $2.00 / Kg; with electricity prices at 3c/kWh (without even using capacity market mechanisms) this is certainly achievable at present. And a few more points – we already have liquid hydrogen tanker trucks mixing with traffic – just as we do gasoline tankers etc. Not a problem – hydrogen is safer than gasoline/NG as it evaporates vertically and passes through nearly all materials. And there are more points; although I may think of a better way to formulate them in the more recent post. Regards! Once we no longer have thermal plants and renewable subsidies are finished then there will be no zero or negative electricity prices. Extremely low prices are an artifact created by production tax credits and coal/nuclear plants which do not want to cease operation for a few hours. The target for hydrogen storage (or other long term storage technologies) it the efficiency and cost of pump-up hydro. PuHS is about 85% efficient and costs $0.10/kWh or less. H2 has a very low efficiency rate. That means that the cost of extracting, compressing and storing would need to be very cheap. Much cheaper than adding a pump to an existing dam. Hydrogen contains less than 10% of the energy as gasoline per volume. That means that to truck H2 we’d need more than 10x as many fuel trucks or railroad cars. To store an equal amount of energy we would need more than 10x the storage space (and H2 is harder to store). I would argue that after a certain point, energy efficiency is less important than it seems. Renewable power is already cheap, and will get cheaper. If we approach a 100% renewable economy, we will likely be spending much more on energy storage than on actual power generation. Studies I’ve read suggest 3-6% of annual energy usage will need to be stored to regulate the system. If we use BEVs, those will cost not just the price of the added electrical generation, but also the price of the energy storage mechanisms regulating that electrical generation. Right now, we don’t need to worry about that because if renewables aren’t generating enough, we just burn more natural gas. If we use fuels generated from excess capacity like hydrogen or synthetic methane, we may need to build more *capacity* due to the inefficiencies, but we won’t need to invest as much in regulating the electrical grid, which could cost more in the long run. I’ve also seen it suggested that the long-term price floor on batteries is higher than the floor on fuel cells, once both technologies are mature and scaled up. And you can choose to be pessimistic, but I remember that people used to be very pessimistic about batteries ever being cheap as well. If that’s the case, it’s a big deal, since with vehicles as efficient as either BVs or FCVs, the up front cost is 1-2 orders of magnitude more significant than the cost to operate. Personally, I think methane is more likely to be the long-term energy storage mechanism of choice than hydrogen, however. It’s safer (for example, we can add chemicals to it to give it the “gas smell”), more energy dense per unit volume, and is more convenient for applications like stoves. More importantly, there is mature technology and an existing infrastructure already built around methane. Hydrogen has three advantages over methane: (1) it is more energy dense per unit weight (2) it is more efficient to turn electricity into hydrogen and back than to do the same with methane and (3) methane is a greenhouse gas, so leaks must be minimized. I think that methane’s advantages more than outweigh those disadvantages. Just tried to drive 3000 km with CNG in NW-Europe, it is a challenge and it remains “scary”, super chargers will be less “threatening” to mom with kids than high pressurte stations with many warning signs. CNG or H2 belongs in trucks not personal cars. While you briefly mentioned the Nikola One truck – farm and construction equipment (tractors, combines, trucks, dozers, caterpillars, graders, cement trucks, etc) are also very good targets for H2 long term replacing diesel. In general the construction and farm equipment machinery is not and would not be close to charging systems. For them would be easier to move to compressed NG or to H2. Hybrid H2/electrics gives the torque and low maintenance needed — as well as the ability to bring the fuel from a central point to the point of use… important in the construction industry. (PS I also worked for years at BA in Kent WA 70’s-90’s). Average lithium battery prices are not the metric to use. The average is derived from both small scale inefficient battery producers and very large manufacturers. We have some information regarding large scale battery cost. Tesla has already stated that their current battery pack cost (using cells purchased from Panasonic) is under $180. Expectations are that once the Gigafactory is in full operation the cost will drop at least 30%. That makes the battery pack price $145 or less (cells making up about 80% of the cost). GM has announced that they are paying LG Chem $145/kWh for cells. Add 20% to 30% for turning cells into packs. H2 FCEVs have three significant long term problems. But first let me address their one ‘advantage’ which is a combination advantage/disadvantage. FCEVs are faster to fill than EVs are to charge. EVs need to visit charging stations only on driving days which exceed their range. Most people drive over 200 miles in a day rarely. And they generally stop for a half hour or so for a meal. Their EVs can be charged during their meal break so little to no time is lost. FCEVs have to visit a fueling station several times per year. If one adds up the time from diverting from route until the car is back on route we’re looking at several hours per year spent filling when EV drivers will simply take a few seconds to plug in when they park. First, it takes a lot more energy to move a H2 FCEV a mile than to move an EV. It takes energy to crack H2O, more energy to compress the H2, and further energy to distribute the H2. For every mile driven we’d need to install 2x – 3x as many solar panels and wind turbines. Those costs will be included at the pump. Second, we’d have to build H2 generation, transportation and distribution infrastructure. Think replacing our oil refineries, tanker cars/trucks, and gas stations. Of course we’d need far more tanker cars/trucks and massively larger storage tanks at our gas stations since H2 stores only a small fraction of the energy of gasoline. Those costs would need to be recovered in fuel costs. EVs need very little additional infrastructure. The distribution is already in place. We’ll need to add some charge outlets for the <50% of American drivers who currently don't have an outlet where they park. And we'll need more rapid charging stations. Other than that we'll need more turbines and panels but only half to a third as many as we would need with H2 FCEVs. Third, there's the "King of the Mountain" problem. EVs will almost certainly knock ICEVs off the mountain because they should soon be cheaper to purchase, are cheaper to operate, are more convenient (plug rather than pump), and offer a more comfortable ride. There must be significant reasons for a newcomer to knock down the ruling king. FCEVs will not be cheaper to purchase than EVS when they might appear in number. It takes large scale manufacturing to reach economies of scale. Nissan has stated that it will take manufacturing levels of around 500,000 units per year for EVs to reach price parity with ICEVs. FCEVs will not be cheaper to operate per mile (see #1). FCEVs will be less convenient to drive due to the filling issue. At this point there are no foreseen king-killer features for FCEVs. Here’s a link about a Tesla-X driver that drove their vehicle across North America… the 200+ mile range isn’t a problem in the denser populated areas… but its a problem in the more remote and rural areas. A perfect Lithium battery would have one electrode that is entirely lithium metal, a perfect insulator that allows lithium ions pass without the dendrites forming… and the other electrode a very low resistance material. That get’s the highest energy density… and in scale the cost might come down.. but unless the insulator is perfect and manufacturing is always precise – you’d have a potential problem with thermal run-away. Lithium ion batteries are trying to reach that utopia battery – and – at some point in the future the progress you see them making will slow down significantly. H2 as noted in the authors story is years behind the Lithium battery progress – but – there still remains significant opportunity for improvement. Large enough space that in ten years H2 could surpass Lithium ion batteries. The determining factor as which will be the long term direction is not the current state of the technologies — and it isn’t the current price or price projections. Its going to be how ubiquitous the charging or refueling stations are… how fast you can charge up the storage device. H2 – has the long term advantage of working in more remote locations without the robust electric infrastructure that would be required. H2 can also be implemented and used in more industrial applications… and of course H2 as a fuel benefits from the progress of batteries — since most H2 transportation applications have a need to recapture energy during braking or motion changes. You need to think of the status of the FCEV as the same point we were with PV modules about 20 years ago. It took lots of slow progress and strange twists before PV was really accepted as truly a viable solution. Go to this page and scroll down to see where Tesla Superchargers are currently located. Then click on ‘2017’ to see the expected locations by the end of the year. Now consider how many more may be added next year as hundreds of thousands of Model 3s hit the road. And add to that thousands of Destination Chargers located at hotels. They are capable of charging 50 miles per hour, 400 miles while you sleep for eight hours. Unless we change the laws of physics hydrogen is not going to become a better way to store energy in a car than batteries. Unless we change the laws of economics a hydrogen infrastructure is not going to cost less than sharing the electric grid. There was a route to cheap solar panels. There’s no route I can imagine around the energy required to crack water and compress hydrogen. There’s no route around the cost of hydrogen factories and distribution systems. Charge times for batteries will almost certainly decrease. Mostly what is needed is a larger ‘pipe’. Tesla has already boosted the output of their SC stations once with plans to make another large boost in the works. I think the problem is assuring that battery temperature can be adequately controlled during very fast charging. Tesla has said that they expect to eventually get down to the 5-10 minute range but that’s not really needed. If you can recharge 200 – 250 miles in 20 minutes and fully charge while you sleep that’s all that’s needed. Works the other way. Let’s say you want to cross the Outback in Australia. Every 100 miles or so we install a rapid charge station with solar panels and batteries. No need to build a hydrogen filling station and truck hydrogen hundreds of miles.